Probability problems may involve interpreting statistical data. 40 students were given a test. The table below shows the cumulative frequency of the results obtained. 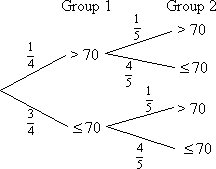 a) State the probability that a student chosen at random will have a mark less than or equal to 60.
b) Two students are chosen at random from the 40 students. Find the probability that neither have marks more than 60.
b) Neither have marks more than 60 means that both have marks less than or equal to 60.